Creme caramel, caramel popcorn, caramel sauce on a sundae, caramel apple, salt water taffy, pecan-caramel crunch, ice cream, dark chocolate filled with caramel, cheesecake with caramel frosting, carambars, dulce de lece, English toffee, caramel pound cake, caramel macaron, honeycomb, tiny caramel tarts, crunchie bars and the very festive croquembouche. I love them all. 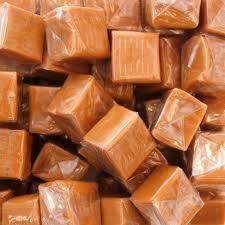 But for me the Holy Grail of caramel is salted caramel sauce with fleur de sel. 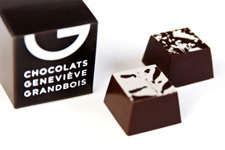 I have tasted many different kinds over the years and my favorite one by far is made by Chocolats Geneviève Grandbois. 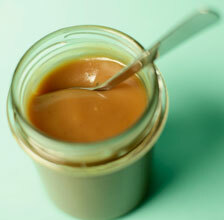 Her caramel is rich, creamy, buttery and even has a smooth velvety texture. The ultimate indulgence. I could give you countless tips on how to use it, from drizzling it on ice cream or spreading it on a toasted brioche. I still believe that the best way to enjoy this caramel is to take a small spoon and to offer yourself a divine moment. You will only need one spoon of this sumptuous mixture to satisfy your palate, I promise. And don't keep this delight to yourself! Share the love because this petit pot de caramel makes the coolest hostess gift. I guess by now you understand why I named my blog Pearls and Caramel! Blooming Beauties In Every Color!